When the Crouch End high street began to lose its spark in 2007, a local resident mobilised her North London community to take action. With the UK on the cusp of a recession and more people choosing to shop online, the Crouch End high street was starting to see changes in 2007. For Richmond, the “opportunity lay in building a collective high street brand to increase profile and add value through community engagement”. She came up with the Crouch End Project, a single brand name under which all businesses in the area could operate. “There were lots of small shops which people didn’t necessarily know of or remember,” explains Richmond. She felt it was “vital for the high street to communicate as one entity to have greater impact and engage the community more effectively”. With no money, no templates and no infrastructure in place, Clare focused initially on mobilising the local businesses. She invited 150 local businesses to an initial meeting, with only three turning up. Richmond and the three businesses continued their conversations with other shops, and three months later another 22 businesses had signed up to the project. The next step was to secure funding to put together an initial three-month plan for the project. “The businesses understood the value of the Crouch End Project and so were happy to contribute whatever they could afford,” says Richmond. Donations ranged from a one-off £15,000 to as little as £20 a month. “When working on grassroots projects you have to work with what there is,” adds Richmond. The funding covered costs such as the local designer who created the branding, merchandise, and later down the line, a website to promote the project. 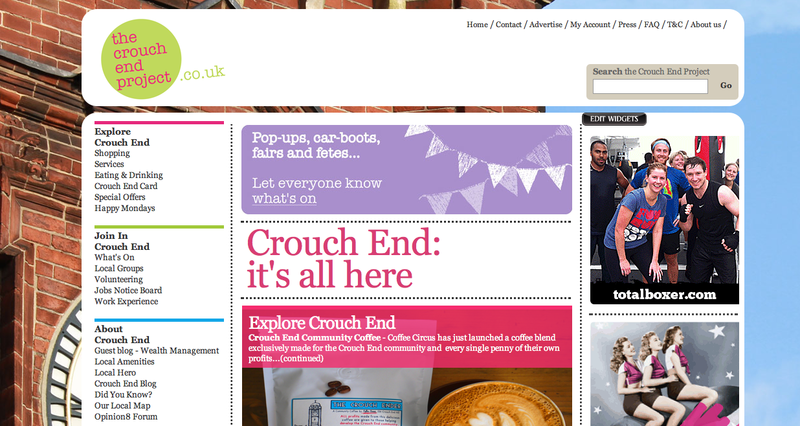 Over the next 18 months, the Crouch End Project held monthly late night community events, produced and sold 5,000 branded bags, launched a website and a loyalty card, and created a brand that was trusted, for and by the community. Over that time thousands of people attended a range of events, which included a fashion week and a whole month of environmentally friendly activities. Once enough businesses were on board Richmond engaged other resources within the community to help support and drive activity. A team of young people were recruited as ‘brand ambassadors’ and properly trained to promote and represent the Crouch End Project. “It was vital to involve people properly, not just hand them flyers to give out. As a result their input was invaluable, and their commitment outstanding." So was the project successful? Did it create sustainable change? Ten years later the Crouch End Project is still talked about and many have tried to replicate its success, says Richmond. “Its real success was in mobilising existing businesses to think differently about engaging their customers, and, in doing so, adding real value to the community.” Over 200 businesses and organisations were involved, including the local library, hospital and local schools. The website received a vast number of enquiries from the community, 10,000 loyalty cards were distributed and enquiries were received from businesses interested in moving into the area — Oliver Bonas, Bottle Apostle, Jo Jo Maman Bebe and Waterstones are just some of the new businesses in the area. As a grassroots project there were no sophisticated measurements available, but as Richmond points out vacancy rates remain low in Crouch End, and there is a renewed sense of place and possibility in the area. Despite the project coming to an end in 2018, businesses are continuing to work together to launch new community events. Richmond invested a lot of time in the project. “I hadn’t anticipated it growing in the way it did and I did get swallowed up with it to begin with," she explains. Once she was able to start delegating work to others and the website was up and running, she was able to step away and work on other projects. Based on her experience of mobilising people through the Crouch End Project, Richmond founded SpeakTo in 2011 to support communities, businesses and organisations to inspire and harness grassroots attitudes and deliver sustainable change.